Written for those who want to know more about the Middle East than the mainstream media is willing or able to tell, this book begins by examining a question that has been asked by numerous commentators since September 11, 2001: “Why do they hate us?" 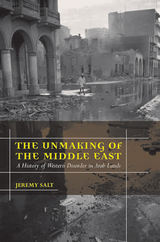 Jeremy Salt offers the background essential for understanding the Middle East today by chronicling the long and bloody history of Western intervention in Arab lands. In lucid detail, he examines the major events that have shaped the region—ranging from the French in Algeria and the British in Egypt in the nineteenth century to the Palestinian-Israeli conflict and to the continuing war in Iraq. Linking all of these together, Salt paints a damning picture of a sustained campaign by Western powers to dominate the Middle East by whatever means necessary. Throughout, he emphasizes the human cost of the policies put in place to preserve "Western interests" or in the name of bringing civilization, democracy, or freedom to the region. Making use of extensive research in U.S. and British archives that reveals what politicians were deciding behind closed doors, and why, this is a book that will change the way we see the Middle East. Jeremy Salt teaches in the Department of Political Science at Bilkent University in Ankara and is author of Imperialism, Evangelism, and the Ottoman Armenians, 1878-1896.